This takes priority over everything else. Work begins once the author has finished editing the new chapter (which is usually around Sunday-Monday Japan time). Release schedules will be about the same as the previous Death March translations. However, if a new Death March raw is out and edited, work for this project will be halted and all efforts will be directed toward translating the new Death March chapter instead. It will then resume afterward. 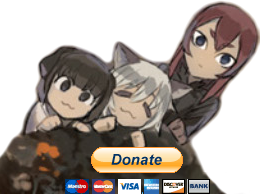 I will also accept donations for this new project in which case, a donation-driven chapter will take priority over non-donation-driven Death March chapters. So be sure to write which novels you're putting your fund toward or if you don't want to happen. I'm going to revisit Death March chapters starting from 1-1 to check for any translation errors as well as edit them with the help of an editor who's already sent me his works (thanks Subsinexus!). This will be done in a relaxed manner with no schedule. It's done when it's done. Revised chapters will have 'Revised' tag on them for easy searching and I will put them up on the Status bar whenever I'm done with one. Will fix the format and add chapter titles. Will be done as I revise old chapters. And lastly, thank you very much for all your supports the past almost-two years, we couldn't have gotten this far without you guys. Thank you and look forward to more!